1- Place a soup pot over high heat. Once the pot is hot, add extra virgin olive oil. 2- Add the squash, sweet potatoes, onions, carrots, potatoes and celery. Stir well and cook over high heat for 4 minutes. 3- Add the garlic and season with some salt and pepper. 4- Add the cinnamon sticks and stir. Add the wine, bring to a boil and reduce the liquids by half. 5- Add enough water to cover the vegetables, bring back to a boil and cook for 25 minutes or until fork tender over medium heat. 6- Remove from heat and remove the cinnamon sticks. 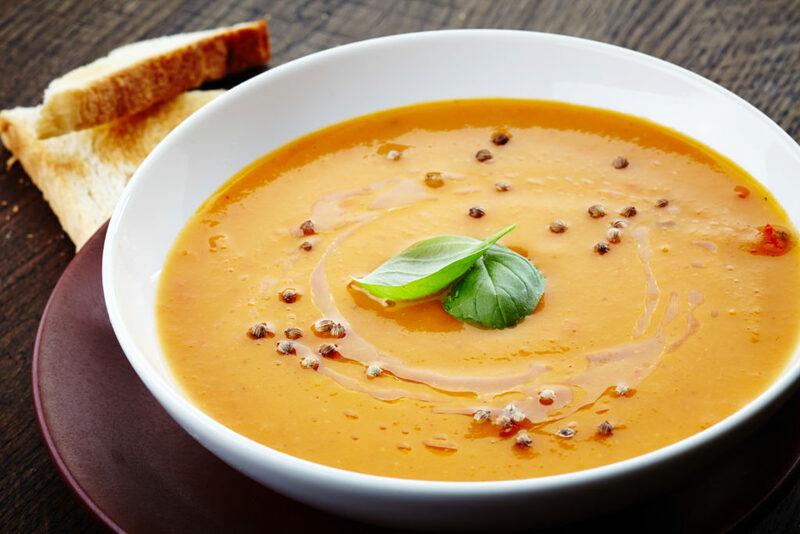 Using a drink blender, mix the chunky soup into a smooth textured soup. 7- Please blend the soup carefully. You will need to let each batch run for about 2-3 minutes to reach the dried consistency. Remove from the blender into a clean pot. 8- Once you blend all the soup, place the pot on low heat. Adjust seasoning with salt and pepper and the thickness by adding water if needed. Please note that the consistency should be such that when you dip a spoon in the soup, the soup will stick to the spoon. 9- Do not boil the soup – bring it to hot temp and serve immediately. 1- Place 6 ounces of soup in a bowl, then place some toasted pumpkin seeds in the center of the soup. 2- Drizzle some truffle oil around the pumpkin seeds, then sprinkle some chopped chives and serve.